When you're starting to ask how to get from Power Level 500 to 600 in Destiny 2: Forsaken it's time to talk about a brand new resource for the game's second year. 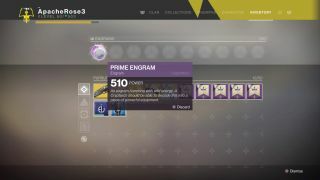 Destiny 2: Forsaken Prime Engrams are a new type of Engram that will compliment your grind for powerful gear as you work your way through the various Daily and Weekly Challenges in Forsaken. You may not have heard of them before, but you will want to keep your eye out for them, and figure out the best way to get one. They are guaranteed to drop loot that's higher than your current Power Level, meaning it's a great way to boost your Power before you attempt to take on the Destiny 2: Forsaken raid. You will get your first Destiny 2: Forsaken Prime Engram when you hit Level 50 in-game from Rahool, the Cryptarch himself. After this point you will have a chance of getting a Prime Engram when defeating powerful enemies (those with a yellow health bar) and completing Crucible matches. At the moment, everyone who's received their first Prime Engram will have the Prime Attunement buff applied to their character. This is heightening the chance of receiving a Prime Engram for doing the above activities, so it's worth hammering those higher level enemies - through Wanted Bounties, Lost Sectors, or even Heroic Public Events for example - and dipping your toe into the Crucible fun. Your Prime Attunement buff is currently redistributed to you with the Daily Reset, but it's not clear when it'll disappear at present. As is the way with most things Destiny, we're all still figuring this one out. It also seems that you don't technically need the buff to get Prime Engrams, but it might just take you a bit longer to get yours. I've gotten them through doing Vanguard Strikes via Zavala's menu in the Director, and by taking out the boss of Lost Sectors in the Dreaming City. According to various Forsaken streamers, it's looking like undertaking the Strand Lost Sector and the Chamber of Starlight are two lucrative ways to almost guarantee some Prime Engram drops.